A couple of years ago, MySpace was the hottest thing on the Web. But that was a couple of years ago. Now the social network has gone cold: It is losing audience to Facebook and other sites and may well lose a very lucrative search deal from Google (GOOG). Fixing MySpace is the chief priority of Jon Miller, the former AOL boss who was brought on as News Corp.’s (NWS) chief digital officer in March. About a month after that, Miller brought on former Facebook executive Owen Van Natta and a new management team to run MySpace, displacing the site’s founders. Time for Van Natta to tell us just how he intends to save what was once one of the most important sites on the Web. And time for Miller to explain the digital future for the rest of News Corp.–which happens to own the All Things Digital Web site and conference. Walt whips out his poll data again. 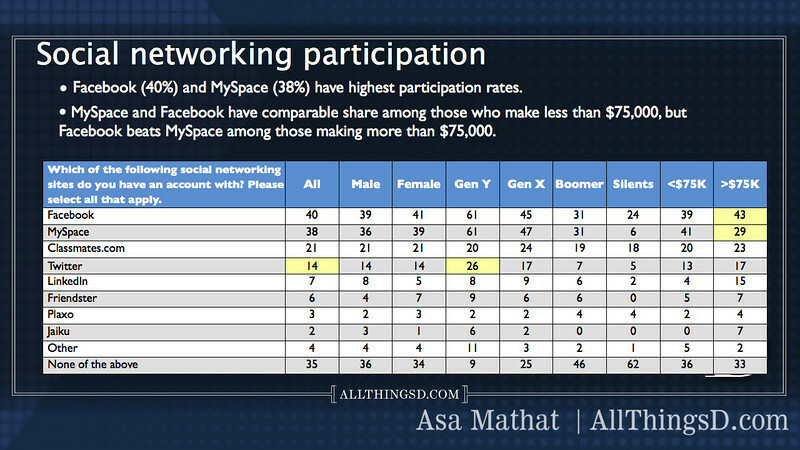 Points out that Facebook and MySpace are neck-and-neck in overall use. But 61 percent of people say they are using MySpace less often than they used to. “Less usage would be bad,” notes Owen. Back to the poll: Why did people use MySpace less? Nearly one third–30 percent–replied: “I got bored.” Owen thanks Walt for the free market research. Walt: Gimme some examples of how MySpace is different/unique. Owen: It’s more open, people share more information more freely, a bigger canvas, the ability to create pages that I don’t like the look of but people do. Kara: Jon Miller, tell me about the parking story at AOL. Jon: Did I tell you about this? Ok. A month after I go to AOL, following the merger with Time Warner, I went to visit people. Visited a division of Time Warner and senior staff. Hostile vibe. I tried to defuse it with parable about what happens when your car gets towed in New York, and how the people who work in the car lot didn’t actually tow your car, so please don’t yell at them. Walt: Can you make this work with just advertising? Jon: It’s the central question of our time in the media right now. Free vs. paid. Obviously consumers want everything to be free. Kara: “You’re a Communist.” Jon: Obviously that doesn’t work. “It’s pretty clear that there has to be some recognition of value.” And we’re starting to see that take shape. And there has to be recognition that different things have different value. If it’s all free or all ad-supported, it won’t work. Ask Jeff Zucker about that–he loves the cable business. The real question is how much, and who’s going to pay, and is it going to be bundled? The gang draws parallels between the cable business (content plus access) and the old AOL (content plus access). Could that work somewhere else? Jon: The $10 wholesale price for a CD isn’t coming back. Maybe it’s $6. Maybe it’s $8. Those changes put big pressure on that business. We’re not just going to come out of the recession and see everyone spend the same money they used to spend. Owen: MySpace is a really big site. Of course I’d want that job. I like building things. I built houses in high school in Palo Alto. At MySpace, there’s such opportunity to build. Kara: You were at Facebook, left Facebook, went surfing, then Playlist, then this. Is there a connection? Owen: I’ve always liked social networking. Was at a start-up that got bought by Amazon (AMZN). Facebook vs. MySpace: Fundamentally different. MySpace focused on a platform that allows people to be super-creative. Music is a big thing on MySpace. 550,000 people are friends with Green Day. Consuming their albums. We sponsored a secret show. Jon went and scared the band. Walt: My kids are musicians and have pages on MySpace. I asked them, and they say they never go there, except to promote the band. They’re both on Facebook and they both Twitter. Is MySpace too closely linked to music, too narrowly branded? Or is that a big advantage? Music’s a huge advantage. We have joint ventures with the major labels. But video is a big advantage, too. My job is to bring teams together to figure out what people are doing, and give them the right tools, and if they’re not using it, figure out why or stop doing it. Jon: People only change their behavior for a few reasons. One is music. I also think what’s interesting about the Web is you can nail something for a single group, and it can broaden out. For MySpace that was music, and for Facebook that was college. Walt: People think all these social networks are for kids. But do you want to aim at a single age group? Owen: We have 130 million uniques. But we need to core down and heavy up where you have traction. And we need to focus on younger demographic. Is Facebook a competitor? Jon: Yes. But so is everything else. So is Twitter. Walt: Seems like these things naturally evolve from one site to another. How can you recapture that excitement from a few years ago? Owen: We already have 130 million people coming to the site every day. If we can excite them with new products, that can happen. Owen refuses to disclose super-secret disruption plan? Not saying, even though Kara threatens to touch Owen’s knee, Bartz-style. Jon sings the praises of innovation and liberating employees to let them be more entrepreneurial so they can iterate. There are some recurring buzzwords here. Walt wants to know if there are ways to monetize MySpace that haven’t been tried. Jon: In advertising, it means a lot of things. Premium, performance, search, etc. We’ll have things like targeting, and micropayments, and we’ll be able to introduce subscriptions for some products. Kara: What’s up with the Google (GOOG) deal? Owen: It’s important, but it’s not the majority of our revenue. Also, it’s half over. So we need to be heads-down focused on our own site. With these long-term deals, you need to figure out how to make them work. This is no different. The most important thing is how is Google going to feel at the end of this partnership? Jon: When it comes time to negotiate, one thing to think about is whether we could do an overall deal with Google that wraps in more News Corp. properties. Q&A: Sorry, missed the first question. The second question is yet another one from Mark Glaser, who is popping off at every one of these. He wants to know why MySpace is so loud and garish. Owen: I don’t like a lot of the loud stuff either, so we need to work on personalization. Kara: What about Facebook’s fascist approach, where it works the same for everyone? Owen: We are going to look different and feel different than everyone else, and that’s good. Jon: The tendency when you fall behind in product areas is to think that you have to catch up by checking boxes. I think that’s wrong. You should leapfrog and focus on emerging behaviors, and go for the big moves. Question: Lessons from AOL? Jon: Yes. Everything I did I should have done faster and sooner. Ethan Smith from The Wall Street Journal wants to know about music and MySpace. I don’t quite follow it. Oh, it’s about labels complaining about that they’re not making enough money from MySpace. Edgar Bronfman Jr. is the most vocal here. Owen: I’ve talked to Edgar and it’s a complex partnership, and we’re figuring things out together, just like Google. Quentin Hardy from Forbes wants to know about organizational behavior theory. Jon: Keep market-facing. That’s the No. 1 thing. It must also be metrics-driven. You have to know how your stuff is being consumed, by whom and how they’re doing it. Once you start doing that, you’ve got a shot. You also have to make sure you’re looking at the right metrics. Page views, for instance, may be the wrong metric, if generating page views upsets your customers. Market share across social networking platforms.